in her Board and Care. but as always, I probed further. "How did I get that phrase?" I asked. from my ancient past or from the stars. "Mama, always Mama," she said. "And we never had mush. said "Mither" or "me mush"
"Mither, I want me mush"
was my first line of poetry. and it's got a fine rhythm. 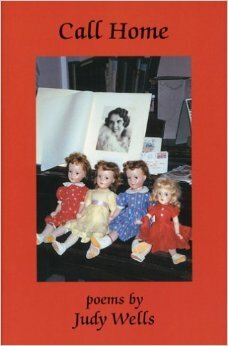 The Wells Family: from left to right, Buddy, Judy, Nancy, and Mimi. 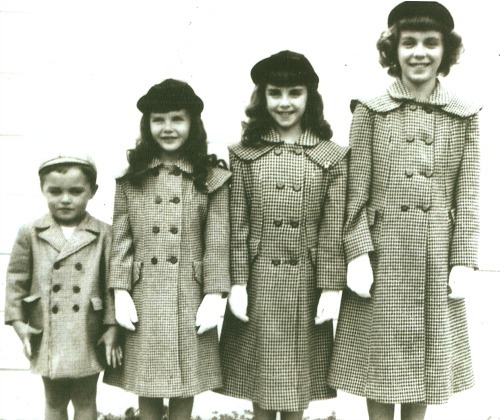 Martinez, California in their new winter coats made by their Mother. Photo by Mel Wells, Sr.
lined up on the dining room table. still filled with gray hair. lined up in the closet. the one I brought her from Ireland. and she left it forever. and felt freed from our stuff. but who would clean up our place? and a plaster cast of my overbite! She says "I've left all that behind"
with fragments of my childhood.